After more than 14 years of award-winning artistry, including paintings, albums, video games, and comics (like his celebrated American Elf series), James Kochalka is still a man in pursuit of new frontiers. And as 2012 comes to a close, it seems he has finally found the missing piece of his artistic puzzle, albeit in the most foul-mouthed of places. Initially published by Top Shelf in 2005, Kochacka’s SuperF*ckers depicts a world in which super-powered teens occupy their time with swears, violence, and general vapid absurdity. Now, having found a devoted following, the SuperF*ckers are making their way to the small (online) screen courtesy of the author and his new partner Cartoon Hangover. 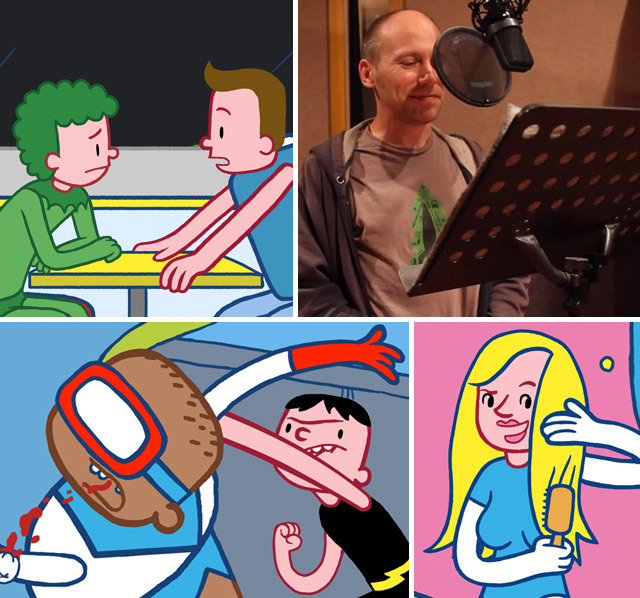 As always, James is treating the SuperF*ckers cartoon project very personally, even taking on some voice acting duties. However, this time he is not alone, as his new show has drawn amazing vocal talent, from cult favorites like David Faustino and Jaleel White, to comedic forces like Maria Bamford. If Kochalka’s excitement is anything to go by, the animated SuperF*ckers promises to be one curse-filled show for the record books. Bring a swear jar. The show starts Friday, November 30, 2012 on the SuperF*ckers YouTube page at youtube.com/superfckers. The last time I interviewed you, the SuperF*ckers comics had just gotten off the ground. How does it feel to have reached the point where you now have a cartoon show? I’m so excited my heart is practically ready to burst out of my chest. There’s certainly some major differences between sitting alone at a drawing table and working with a huge team of collaborators. But in the end, it’s just about making stuff, and I’ve spent my whole life making stuff. I’m super familiar with the process of making stuff, any kind of stuff — making comics, paintings, writing songs, designing video games, acting or whatever, and now I can add big budget animated series to the list! Where did the idea to create the show come from? Did you always conceive SuperF*ckers as an animated show or is this new direction sort of incidental? It was originally just going to be a comic book series. I had no plans beyond that. My original idea was to do a grand and serious graphic novel about the interconnectedness of all things, from the subatomic level on up to the cosmic level and beyond. When I sat down to actually draw it I had to condense the idea…and I ended up with SuperF*ckers. It was almost an all-ages comic. I drew two versions of the first few pages, one without swears and one with. The version with swears won. When I was a kid and I bought superhero comics off the spinner rack at the corner store, they were quite difficult to follow. It seemed like I was never able to find two issues in a row, and there were always hundreds of issues of back-story that were a total mystery. So I wanted to recreate that feeling in the comic book. The first issue was issue #271, and then I skipped ahead to #273, then #277 and #279. I was just trying recreate the experience I had reading comics as a kid. What’s it like working with Cartoon Hangover? They’re brilliant. The most wonderful thing about working for them is that they believe 100 percent in the work we’re doing. And they’ve worked so hard to make the show possible. It was a blast going to Los Angeles and New York with Fred (of Frederator, the parent company of Cartoon Hangover) to pitch the animated series idea to basically every cable network that allows swearing. None of those meetings ended with us actually getting a deal, but it was incredibly fun nonetheless. I just thought of it as my Hollywood adventure. I enjoyed the high-stakes drama of going into a meeting and presenting the idea. Those meetings are amazing, complex clusterfucks of social dynamics and ego. A very weird and wonderful energy happens in those brightly lit rooms. I loved it. My attitude has always been, take your work seriously, but don’t take yourself too seriously. I just enjoyed the adventure, and didn’t worry about too much more than that. If things didn’t work out like I hoped, I wasn’t going to be bitter about about it, because the adventure itself was awesome. Of course, none of the places we pitched it to ended up offering us a deal. And then the offer from YouTube to fund the show seemed to just fall from the sky like manna from heaven. How close are you to the production of the show? Are you just helping with general creative direction and voice acting, or something even more involved? As the show went on, I became more and more deeply involved, as I proved that I had the ability to handle it. Initially, I think we were actually going to hire writers to write the show, but I ended up writing the whole first season myself, every episode — because I proved to Cartoon Hangover that I was really good at it, and it was doubtful that anyone else would get the tone of the show just right. I was deeply involved in the casting, I worked closely with the director Fran Krause to supervise the voice actors, I did voice acting myself, I wrote songs for the characters to sing, and I helped Fran supervise the composers who wrote the rest of the music. I hand-lettered the some of the stuff for the title cards and end cards. For a while, I considered doing all the background art myself, but there was just way too much to do. I was psyched to do as much as I possibly could, but I was also glad anytime I could find someone else who was awesome who could take on some of the burden. I’d consider bringing in some guest writers in the future, if they were awesome enough. If I could get anyone in the world to guest-write an episode for season two, I think it would be Chuck Palahniuk. We took on Anthony Davis and Dustin Pilkington as the composers. Their background music for this show is wild. Seriously, SuperF*ckers has the best background music of any show ever, really quirky stuff. They also have a band called Best Fwends. Also, my friend Neil Cleary recorded a new version of the theme song for the show with me, and we shot an awesome music video for that. We’ll put it up on Cartoon Hangover eventually. Will you be translating stories directly from the books, or will there also be new story lines? There are scenes that are taken closely from the book, but then they play out quite differently in the show than they do in the book. There are characters in the book that didn’t make it onto the show (yet), and there are characters in the show that were never in the book. From talking to voice actors, I know that making the translation from the page to a voice that represents the character is an impossible task. How did you approach casting each character? When I wrote the early episodes, I first drew them as comic book pages, since that’s the medium I’m most comfortable working in. Then I recorded myself reading all the lines and doing sound effects to make sure they flowed right. And since I had already acted out the whole thing myself, I knew pretty well what sort of voices and attitude I was looking for in the actors. Eric Homan (the VP of Development for Frederator) and I worked really closely on the casting. Some of the actors he brought to my attention, some I brought to his. But we didn’t cast anyone that we didn’t both love, and we were usually in complete agreement. The only thing we fought about was whether I would do the voice of Shitstorm. I asked every day for months if it could be me, and then one day he finally just said yes. I loved doing that voice, so much. It’s a mix of a terribly done Ukrainian accent and I don’t know what. My own crazy thing, I guess. I only know one Ukrainian dude, my old friend Eugene Hutz of Gogol Bordello. I just tried to be as awesome as he is. It’s hard, he’s super awesome, and a total amazing and talented rock star. Long ago, before he was world famous, he used to play in my band James Kochalka Superstar, so I’ve seen his awesomeness up close and personal. I’m not playing him though — I’m doing my own thing. One way we did casting was by just trolling through YouTube trying to find someone with a special spark. That’s how I found Veronica Belmont, who plays Grotessa. I found a compilation of clips of her from the talk show “Techzilla” and thought she was awesome. And some we found the old fashioned way: by holding auditions. We gave the agents brief excerpts of the early scripts, and then dozens of actors would send us recordings of themselves doing readings. Maria Bamford is a favorite comedian of mine. 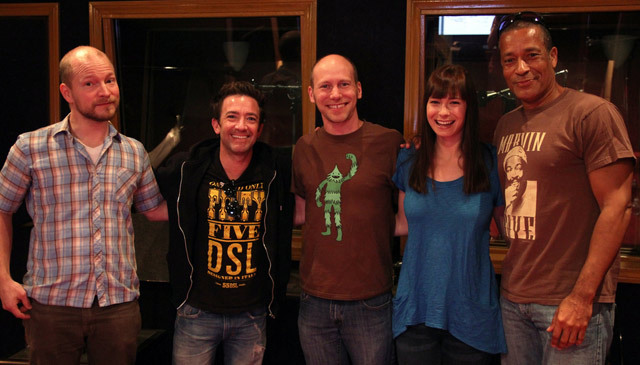 Can you talk a bit about how she and actor David Faustino came to be a part of SuperF*ckers? She does a lot of voice acting on “Adventure Time,” which is another show that Frederator makes, so they already knew her work very well. Eric Homan suggested her for the voice of Princess Sunshine. But I really wanted her for a different character! I couldn’t find any dude with the right voice to play Computer Fist, but she absolutely nailed it. We ended up casting her in both roles. It’s amazing when her two characters are in the same scene — you would never guess that both voices are played by the same person. And Computer Fist has a crush on Princess Sunshine, so that must be pretty weird for her as an actress. David Faustino simply sent in the best audition tape, that’s it! I didn’t recognize his name, so I didn’t even know that I was casting the kid from “Married With Children.” I don’t think there’s any other actor on earth that could have done the voice of Jack Krak so perfectly. I’m so very thankful that he’s on the show. The second best audition for Jack Krak was by Phil Morris, who we ended up casting as Jack’s friend Ultra Richard, which was another role he auditioned for. Man, they are really dynamite together. He’s got this laid back, deep voice that contrasts wonderfully with the more manic Jack Krak. Basically, I thought about the characters in pairs, and then picked the voice actors accordingly, to make sure that their voices really worked well together as a pair and played off each other. You seem like you’re usually a pretty low-key guy but, based on the behind-the-scenes videos, this project looks to have gotten you pretty excited. What are your expectations with the series? Any desire to see any other of your work animated? Am I a low key guy? Maybe if you meet me at a comic book convention. I’ve been super, super shy my whole life, and I’m just hanging on by a thread at those things, trying to stay in the game! However, my new official response for every fan I meet is hugs and high fives for everyone. I’m trying to pump it up a notch so no one goes away from meeting me feeling disappointed. I’m trying. But yeah, I’m crazy excited about this show. I don’t know what to expect. I’m nervous about it, though. Super nervous! All I know is we did really good work, and made an awesome show. But will it be popular? I want it to be a success just because it was so much fun to make, and I want to make more! I’ve got so many more stories to tell, so many directions I want to explore with these characters. If this first season does well, maybe I’ll get the chance to continue. I did write the first script to a totally new animated series just last week, though. I think it’s too early to do more than tease you with that tiny bit of info, however. The SuperF*ckers animated series starts November 30, 2012 online at Cartoon Hangover.